The Kahuna LM-7000 is as great a purchase as the bestselling LM6800, with a number of feature upgrades thrown in. In this review, we’ll tell you all about those improvements, just as we’ll dive into the strengths and weaknesses of this new model. The Kahuna LM-7000 is a premium version of the popular Kahuna LM6800 (read our review here). The core features are the same except for some improvements like the adjustable massage time, longer warranty, and easy-to-use remote. Some important issues with the 6800 have been fixed – now the motors are quieter, the manuals are much improved, but the rough roller problem still persists. With these new features the price has jumped, but the Kahuna LM-7000 is still a feature-rich massage chair at only a fraction of the price of real premium chairs. As we see it, the only real competition for the LM-7000 is its predecessor, the 6800, which boasts of practically the same features and design for a lower price. AJX.LLC is the company responsible for the Kahuna massage chairs. They’re also a leading name in the massage chair industry and have a strong presence in the US market. Their chairs are often in bestseller lists and they are often lauded for their excellent after-sales support. The Kahuna LM-7000 has an amazing 5 year warranty. This is one of the major upgrades from the LM6800. First 2 years – It covers all parts and labor cost. Customers do not pay anything within the two years. We offer on site repair services. For the 3rd year – Warranty covers parts. However, customers need to repair own or ship their products to our company. Customers must pay 1 way shipping cost. From the 4th to 5th years – Warranty covers structural framework. People often ask what the differences of the 6800 and the 7000 are. And do the improvements justify the extra cost? This table shows the key differences and should give you a clear understanding of the upgrades on the premium version. The Kahuna LM-7000 might be a few hundreds more expensive than its 6800 counterpart but it is still a great buy for the value it can give. 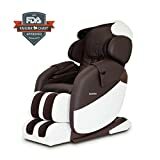 The 7000 checks almost all the most important boxes you’d want in a premium chair and at such a much cheaper cost compared to the $5000 or $8000 massage chairs that populate the high-end of the market. The Kahuna massage chairs have such well-respected after-sales support, it deserves many mentions. If you ever experience trouble with your chair, you can count on getting help from both the manufacturer AND Good Price World which is the Amazon distributor. Not only are they very responsive with direct inquiries, they’re quick to reply to questions and even contact people who share problems with their chairs online. In our book, this is service over and beyond and thus highly commendable. Yes, the Kahuna LM-7000 alleviates pain. Many Americans who used to have regular appointments with massage therapists and chiropractors have simply stopped going after buying their Kahuna chair. The chair does such a good job of relieving pain that they were able to save thousands of dollars after buying it. But more than just being a great investment, the awesome thing about the Kahuna is how it can alleviate pain including acute pain, chronic pain, pain of the lower back or shoulders, or pain from herniated disks, ruptured discs and so on. If you’ve ever had to live with pain from these disorders, pain relief is a blessing straight from the heavens. You’ve always heard the advice to “put up your feet”. Because we are on our feet the whole day with gravity literally weighing us down, it’s easy to see why we have pain in our feet and back. Zero gravity technology in massage chairs help with this by taking the weight off our feet and distributing it all across our body. This relieves pressure in the spine and takes stress off the body. Blood and circulation to the heart is also improved in this position hence the therapeutic effects can be felt immediately. Another blessing for those struggling with pain. The quick heat to the back and legs can help anybody with back or feet pain. Blood vessels dilate and increase the flow of oxygen and nutrients to the muscles healing damaged tissue. It’s also an excellent way to get warmed up during the cold months. While the Inada’s Dreamwave technology is heads and shoulders above the competition, the Kahuna massage chairs actually have something similar. The airbags can inflate and twist the body left and right. A deep stretch is applied to the shoulders, hips, and thighs. Most massage chairs need around 15 inches from the wall to assume Zero-G position. The Kahuna massage chairs only need a small recline area of 5 to 6 inches. Noise Level. The LM-7000 is a quieter and smoother experience now. Manual and instructions. NO more indecipherable and unintelligible assembly instructions. As of July 2016, they’ve updated their manuals so that they are now easier to understand. And a plus is the improved Easy remote. There is a rather big price leap from the 6800 to the 7000 and at current prices we’re not 100% convinced that the premium features are entirely worth it. If you’re cash-strapped in the first place and looking for a budget chair, it might be best to just stick with the LM-6800 (which is the crowd favorite anyways). So, just unzip the foot roller cover, and put the foam in to serve as buffer for your feet. You can also do the same for the back rollers if you experience any difficulty in that area. If you don’t rate yourself too high in handy-ness, do yourself a favor and get the White Glove delivery. Not only will they lug your massage chair to whichever part of the house you want it in, they’ll also assemble it for you. Self assembly is simple (if you know what you’re doing) and takes less than an hour. It’s a bit of a puzzle but we expected the all-new Kahuna LM-7000 to be more of an upgrade and not just some tweaks to the LM-6800. The upgrades are very welcome and it’s great to see manufacturers taking on feedback and addressing problems. However, unless there is an upgraded feature that you REALLY need, it’s hard not to think you should save some bucks and buy the LM-6800 instead. For example, if you’re an audiophile and want to plug in your smartphone so you can jam to your playlist, then the LM-7000 makes sense. Or if you’re very bothered by noise and will appreciate the quieter motors. The 5-year warranty is also very tempting. On the other hand, if you’re budget-strapped and don’t care too much for the new features, then we recommend springing for the LM-6800. In the end, it’s all up to you and what you need out of your massage chair. If you do end up choosing this model, you are very likely to be very, very happy with it.